Smothered Rib with potato, veggie and a roll. Served with a cup of soup or a salad. 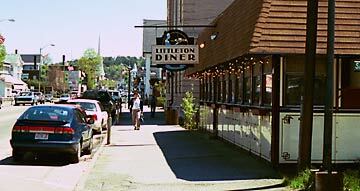 Littleton is a vibrant northern New England town; modern and thriving with a very obvious flavor. Main Street boasts many shops, several with very unique offerings; gift shops, flower shops, art and antique shops, a movie theater -- and the world's longest candy counter that's listed in the Guiness Book of World Records. Right in Littleton you'll find fabulous accommodations from first-class hotels to quaint bed and breakfast inns. So whether you come to vacation, relocate, start a business or just visit our little town, remember to stop by and see us here at the Littleton Diner for real home cooking and North Country hospitality. © 2019 Littleton Diner. All Rights Reserved.